In his monumental narrative of the outbreak of the First World War and the ill-fated Russian offensive into East Prussia, Solzhenitsyn has written what Nina Krushcheva, in The Nation, calls "a dramatically new interpretation of Russian history." The assassination of tsarist prime minister Pyotr Stolypin, a crucial event in the years leading up to the Revolution of 1917, is reconstructed from the alienating viewpoints of historical witnesses. The sole voice of reason among the advisers to Tsar Nikolai II, Stolypin died at the hands of the anarchist Mordko Bogrov, and with him perished Russia's last hope for reform. Translated by H.T. 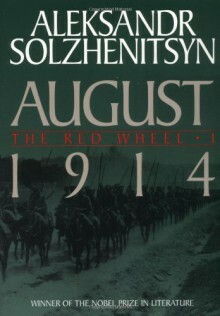 Willetts.August 1914 is the first volume of Solzhenitsyn's epic, The Red Wheel; the second is November 1916. Each of the subsequent volumes will concentrate on another critical moment or "knot," in the history of the Revolution. Translated by H.T. Willetts.